- CAD rises after economic surprises. - Jan trade deficit numbers revised. - But inflation data unlikely to prompt BoC hawks next week. The Canadian Dollar extended gains in a risk-on market Wednesday after March inflation figures surprised on the upside and Statistics Canada revised an earlier estimate of the trade deficit, which has got some eyeing the Bank of Canada (BoC) ahead of next week's policy statement. The data surprises have further buoyed the Canadian Dollar across the board, sending the Pound-to-Canadian-Dollar rate down to 1.7315. The Pound is now 0.49% down on the Canadian Dollar for 2019 and Scotiabank technical analysts are forecasting more losses ahead for GBP/CAD. Inflation rose by 0.7% in March, unchanged from the pace of increase seen in February, although that was enough to push the annual rate back up from 1.5% to 1.9% last month. Meanwhile, two of the BoC's three measures of core inflation surprise on the upside for last month. The BoC's median and trimmed-mean price indices rising to 2% and 2.1% respectively, from 1.8% and 1.9% previously. The trimmed measures had been expected to fall to 1.8% while markets looked for the median number to hold steady at 1.8%. Separately, Statistics Canada said the trade deficit fell to -$2.9 bn during February, from a downwardly-revised -$3.1 bn in January. The January trade deficit was originally reported as -$4.2 bn, although it turns out oil exports to U.S. were higher than previously thought that month. "Core inflation is running right around the Bank of Canada's 2% target (up a bit from a 1.8% average for the three measures of core), but the Bank of Canada doesn't really sweat those small decimal place changes," says Avery Shenfeld, chief economist at CIBC Capital Markets. "Yields are higher on the revisions to the trade data and the reminder that inflation isn't really that cool." Markets care about the inflation data because it is the outlook for consumer price pressures that dictates central bank interest rate policies, and its changes in the relative interest rate outlook which drive the capital flows that government movements in exchange rates. Above-target inflation, as well as signs that price pressures are building from any level, are normally enough to get markets contemplating the odds of an interest rate hike and to given the Canadian Dollar a lift. But the opposite is also true. "The BoC’s Q1 Business Outlook Survey released earlier this week showed little evidence of input or output price inflation, while firms’ inflation expectations moderated. We think Monday’s BOS, which more broadly showed deteriorating business sentiment early this year, sets up for a dovish tone from the Bank of Canada next Wednesday. Today’s CPI report does little to change that," says Josh Nye, an economist at RBC Capital Markets. 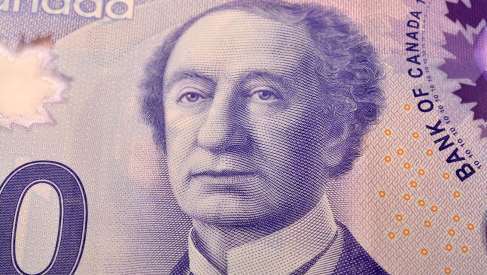 The Pound-to-Canadian-Dollar rate was 0.54% lower at 1.7328 after extending an earlier -0.09% loss. It's now down -0.42% for 2019 and has officially ceded to the Canadian Dollar its place as the G10 league's best performer this year. "GBPCAD is weaker but still effectively range bound. Price action has struggled in the low 1.75s over the past week and weakness below minor (and “vague”) support around 1.7410/20 should see losses extend," says Eric Theoret, a strategist at Scotiabank. "We think potential losses may be limited to the 1.70 area now—rather than the 1.65/1.66 zone—but the pound will need to make new cycle highs (sooner, rather than later) to overcome these negatives." The USD/CAD rate was quoted -0.49% lower at 1.3294 following the release after having fallen from its earlier 1.3335 level. The exchange rate is now down by -2.24% this year. "For USDCAD, we are inclined to fade dips towards 1.3350 - the post-BOS lows. Meanwhile, the 1.3420/50 area represents notable resistance but broadly in line with a narrowing moribund range that has enveloped the pair with 1.33 as the lower bound," says TD's Both. Canada's Dollar was higher against all of its G10 rivals Wednesday, aided by buoyant oil prices and newfound optimism about the outlook for the global economy. China's latest round of economic figures all surprised on the upside. Wedesday's data appears to paint a picture of resilient underlying inflation pressures within the economy, which might surprise some given the -30% bust in oil prices late last year that has since been largely unwound, and given how the economy has slowed of late. 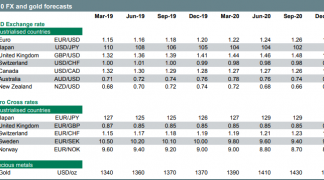 TD Securities' Both and other analysts say economic growth indicators should matter more for the market and Canadian Dollar at the moment, given what the Bank of Canada had to say earlier this week. "The Spring Business Outlook Survey painted a more downbeat picture relative to prior surveys, as demonstrated by weaker investment intentions and the first negative print for the composite BOS indicator since 2016," Both writes, in a note to clients Monday. "The BOS provides a crude reminder as to why we despise the CAD and why it remains a strategic sell on rallies. Our focus shifts topside in USDCAD with 1.3450 a key resistance marker." Many of the indicators contained in the latest business outlook survey fell to their lowest levels since the third quarter of 2016. The survey vindicates the Bank of Canada for not having raised its interest rate thus far in 2019. This week's BoS survey could mean lesser inflation pressures up ahead, which might not be good for the Loonie because it would take robust consumer prices and faster economic growth to get the Bank of Canada to lift its interest rate this year, which might be necessary for the Canadian Dollar to sustain a recovery. The BoC will announce its latest interest rate decision on Wednesday 24 April. Economists are now speculating that it will sit on hold for at least the foreseeable future. 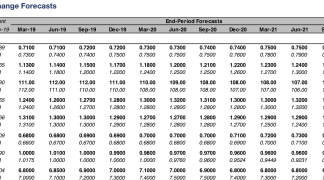 In March, the BoC stopped just short of saying it doesn't expect to raise rates at all this year. This was after a December-to-January u-turn on earlier interest rate guidance that had suggested it could lift its cash rate on as many as three occasions in 2019 and potentially taking it from the current 1.75%, up to 2.5%. But not everybody is on the same page. "The prospect for the BoC to turn its rhetoric more hawkish is increasing despite a dovish Fed. Should global growth continue to stabilize and rebound, financial conditions stay loose,and US growth remain relatively supported, the BoC may once again discuss the need to get rates back to neutral," says Hans Redeker, head of FX strategy at Morgan Stanley, in a recent note to clients. Redeker and the Morgan Stanley team forecast the Brent oil price will rise back to $75 this year, which they say will help lift the Western Canada Select price. That and an anticipated strengthening of the Eurozone and Chinese economies could be all it takes to convince the BoC to lift interest rates again. 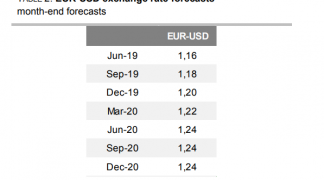 Morgan Stanley has advocated that clients of the bank sell the USD/CAD rate, citing an anticipated pull-back to the 1.29 level later in 2019. However, they're waiting for the exchange rate to rise back to 1.35 again before actually entering that trade.